I could have sworn there was a way to enter a Trace as precipitation amount for a day in WeatherCat. But I can't find it mentioned in the Manual or anywhere on the forum. I tried to enter a T as the amount in the Daily Rain Editor but that appears to just replace the 0.00 amount with another 0.00 amount. Am I just remembering wrong? I know you can enter a Trace in your daily CoCoRaHS report, so perhaps I just got the two confused. Can anyone shed any light here? Dear Blick and WeatherCat west coast drought watchers, . . . . I don't recall any mechanism for entering anything other than numerically measurable amounts of rainfall into WeatherCat. Moreover, when I do a search of the text of the WeatherCat manual for the word 'trace' - it doesn't appear. So I'm reasonably confident there is no mechanism within WeatherCat. However, I can report that there was a forecast of possible showers in Northern California from the remnants of Hurricane Fabio. I did remove the cap off my rain gauge and there were a few drops, but alas no bucket tips . . . . . Thank you sir, I did the same as you to come to the same conclusion. I was just hoping I was wrong. 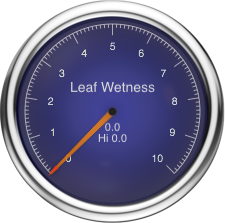 My leaf wetness indicator shows a trace - it's always reading wet prior to any rainfall. I'm sure it doesn't properly define "trace" but it starts reading wetness with a single drop.